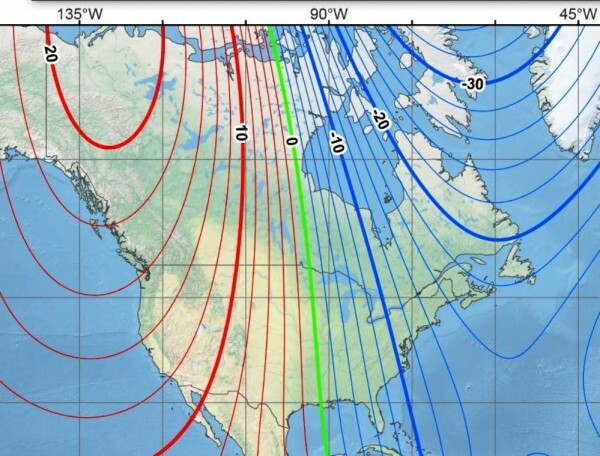 The North Magnetic Pole is restless and getting more so. 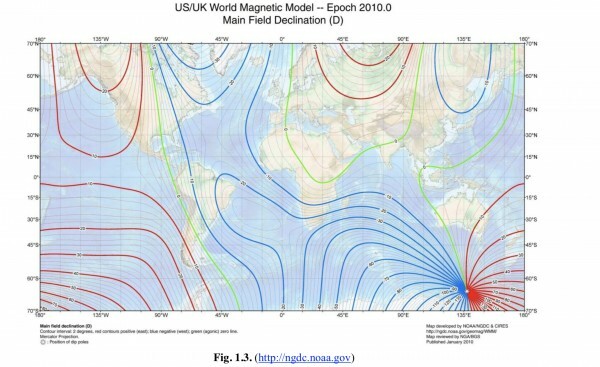 A few years ago a geophysicist from (I think) Cal Tech had written software to model the dynamics of the Earth's magnetic field, including polar wandering and pole reversals. Over some holiday break he let is program run for a couple of weeks without checking up on it and it did model a polar reversal. 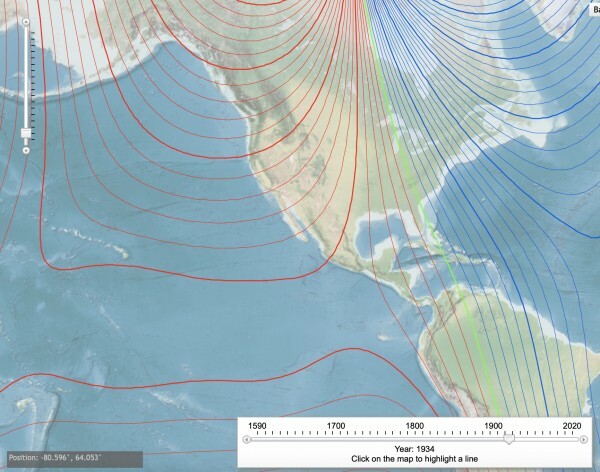 Two of the phenomena accompanying the polar reversal was an increase in magnetic anomalies in non-polar regions, and an increase in the wandering of the magnetic pole. Subsequent detailed paleomag research at Steen's Mountain in Oregon confirms both of these trends occurred during the last polar reversal. 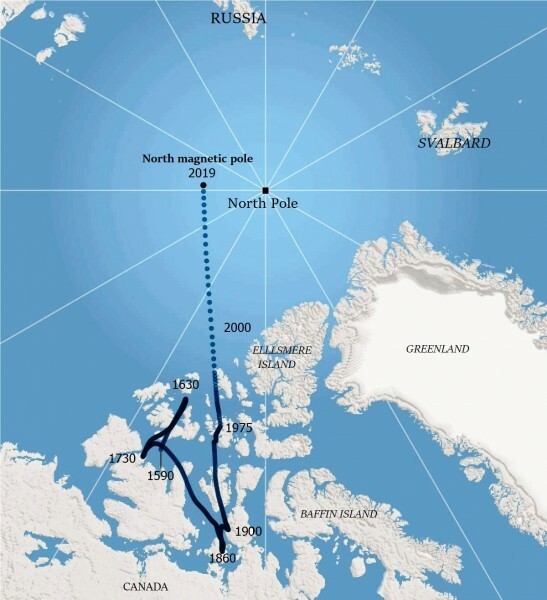 Additional research has shown that both the wandering of the magnetic poles and an increase in magnetic anomalies in non-polar regions is very high at present. All of this points towards an impending polar reversal, although "impending" could mean several thousand years. We are already witnessing a marine transgression and a mass extinction event. Observing a polar reversal would make this the trifecta geological phenomena. What a great time to be alive as an earth scientist! My main (only) question on reading this today pertains to navigation and whether magnetic declensions have changed significantly in recent years. Apparently not -- though I'm not absolutely certain. Article doesn't directly address this. “South of 65 degrees north and away from Canada, the average user will notice very little difference to their daily life,” said Ciaran Beggan, a geophysicist at B.G.S." Randisi, The biggest effect at the Earth's surface during a polar reversal is a temporary weakening of the Earth's magnetosphere and a concomitant increase of cosmic radiation at the surface. This would result in the northern lights (Aurora borealis) being observed farther to the south and the southern lights (Aurora Australis) being observed farther north. There likely could be a statistically measurable increase in certain types of cancer, particularly skin cancer, although this could be mitigated by wearing hats, long pants, and long sleeved shirt outside. Extinction events are not associated with magnetic pole reversals. As far as the solar wind stripping away the atmosphere, this could only occur if the magnetosphere were to completely collapse, and it only weakens temporarily during a polar reversal. Numerous planetary astrophysicists have speculated that Mars had a much more robust atmosphere and hydrosphere when it was a tectonically active planet with it's own functioning magnetosphere. Once it lost sufficient internal heat to achieve tectonic quiescence and a suspension of internal circulation of its outer core (assuming that the interior of Mars was similar to our own planet), the magnestosphere collapsed completely and that is when Mars rather catastrophically lost much of its atmosphere and hydrosphere. The biggest effect at the Earth's surface during a polar reversal is a temporary weakening of the Earth's magnetosphere and a concomitant increase of cosmic radiation at the surface. This would result in the northern lights (Aurora borealis) being observed farther to the south and the southern lights (Aurora Australis) being observed farther north. There likely could be a statistically measurable increase in certain types of cancer, particularly skin cancer, although this could be mitigated by wearing hats, long pants, and long sleeved shirt outside. I think out satellites are also inside and protected by the magnetosphere. Loss or disruption of those could have very severe consequences. So what is the evidence of prior ‘reversals’, how did they find it, and what is the mechanism? I believe the evidence of reversals is at the Mid-Atlantic Ridge (rift?). As it has expanded the polarity of the rock flips every 700,000 yrs or so or what ever it is. Rock closer = younger and vice versa. There is a pattern. We know the rate of expansion so we know roughly how long ago a certain location was created. I know magnetite rock can spin a compass one way then the other way by orientation. I think it's the same concept. The mechanism is thermal remnant magnetism. Basically the alignment of magnetic minerals (mainly magnetite (Fe3O4) in basalt lavas in response to the ambient magnetic field that is preserved when the lava cools below the Curie point temperature. The orientation of these magnetic minerals can be measured in oriented samples using a sensitive cryogenic magnetometer. The 1963 Vine and Matthews paper in Nature "Magnetic Anomalies over Oceanic Ridges" demonstrated the symmetry of magnetic field anomalies (reversals) preserved in oceanic lavas across mid-oceanic ridges. The magnetic anomalies were measured using ship-towed magnetometers. A global Magnetic Polarity time scale (history of the earth's magnetic polarity reversals) has been determined for the last 500+ million years of earth history. 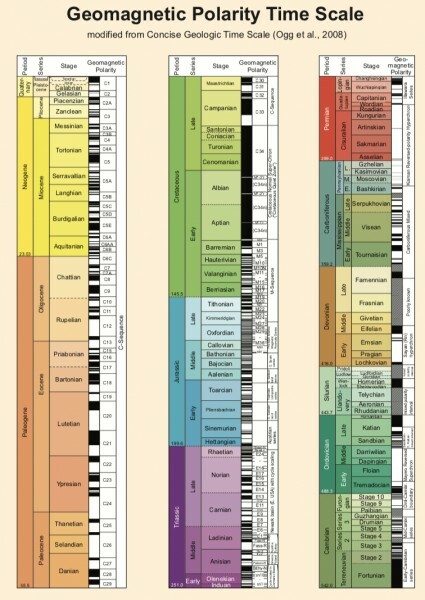 This time scale is based on paleomagnetic measurements of both oceanic and terrestrial volcanic rocks from all over the planet combined with radiometric age dating. Glatzmaier G.A., and Coe R.S Magnetic Polarity Reversals in the Core. In: Gerald Schubert (editor-in-chief) Treatise on Geophysics, 2nd edition, Vol 8. Oxford: Elsevier; 2015. p. 279-295. The earth's magnetic field is simulated as a self-generating dynamo that arises from convection currents in the outer Fe-Ni liquid core. When you look at the behavior of the field over 10^5-10^6 year time scales, the temporally-averaged geomagnetic field is that of a geo-centric axial dipole. Randisi, thanks for pointing out the typo. I like that I now have a declination of 0°. 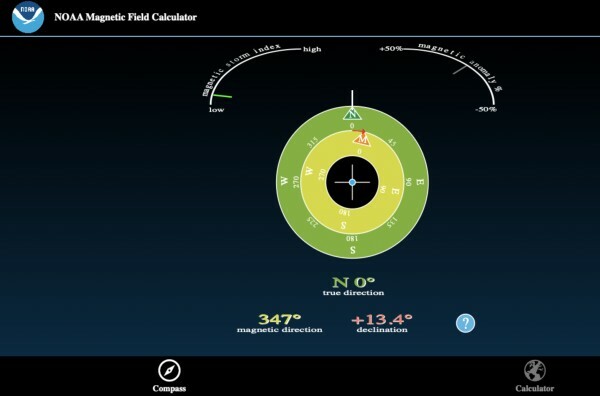 http://www.ngdc.noaa.gov/geomag/calculators/mobileDeclination.shtml for those of you who are looking at this on a phone. 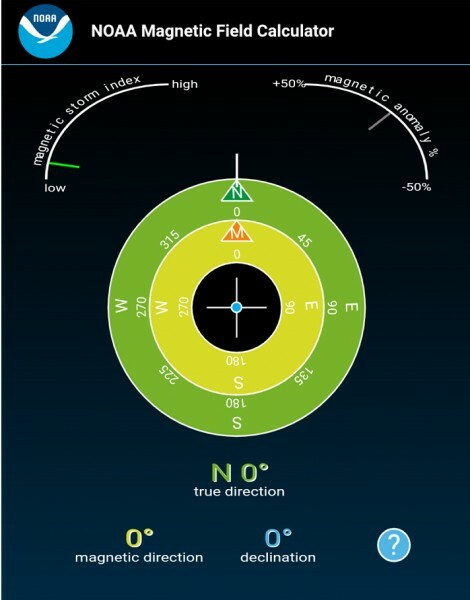 Looks easy: where along the "0" declination line are you located? Is that map you posted up to date? Its title says 2010 and still has me at about 12°, which was my old declination. Easy: the map I posted above is current. At my location in Concord, the declination is +13.4 which is consistent with the 2016 map shown below. Aw, man. Now I'm bummed. I'm just a bit (relatively) south of you. Not sure why NOAA lied to me. But it's still showing me 0° when I go back to that site. Oh well. If this is the biggest problem in my life right now I guess I'm living pretty well. Did the NOAA website prompt you to enter your current location? 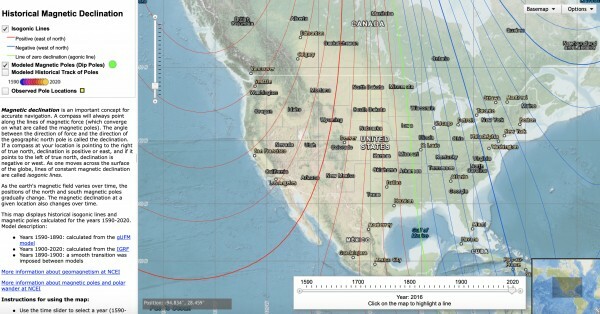 The line of declination doesn't move fast as you stated, but that is relative to your location. What has moved drastically is the 0° line of declination. If you compare where the was on your 1934 map you can see it was off the East Coast of Fla on the 30° line of Latitude in North America. The map below, the most current (February 2019) puts it west of the Mississippi River, a change of 700 +- miles.